AEA PD Online finished its annual update to the training system last Friday. We have several important updates in this email. 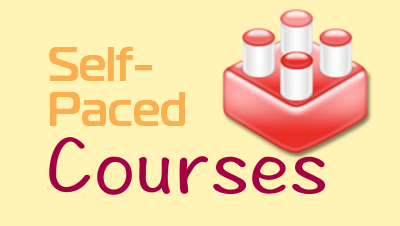 Click here for an update instruction sheet (.docx) for staff taking trainings. Click here for the updated System Admin tutorial, which includes updated features listed in this e-mail. The most important change of note is that we are adding a layer of encryption for extra security. This means that you will be unable to look up employee passwords (though you can still change them). And, it also means that staff will need to reset their passwords the first time they log in. An employee can click on "forgot your password?" and ask the system to reset it. This will send an email to the employee with a link back to the site, where she can reset the password. She can use the same password she has always used. If an employee doesn't receive the email (Hotmail and AOL accounts are notorious for this), she can contact the district contact or the AEA to reset a password manually. A district contact can reset everyone's password within a district to the same one. This is a temporary password, and employees can then change it once they log in. This does not reset system admin passwords. If you feel this option would be best for your district employees, please contact support@aeapdonline.org for details on how to reset the passwords. Because our catalog is growing rapidly (over 150 trainings as of this date), we are updating our catalog. 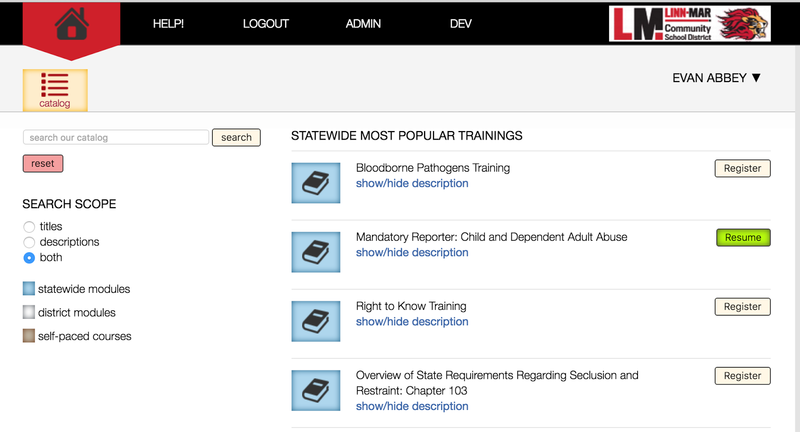 Now, the catalog displays our most popular trainings, our self-paced courses, and any district/favorited trainings. 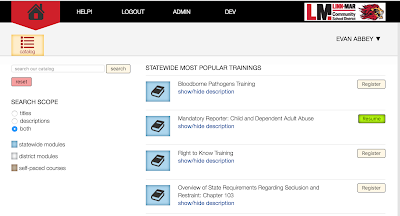 Employees can search our catalog for additional trainings. After the initial search, they can filter their results by topic area, intended audience, or training type. There are several other new features for developers. This includes a streamlined ability to make modules and upload files, as well as the ability to make credentials for employees that can display within the new onsite portfolio. Our Developers Tutorial will be found here once we are finished updating it. In addition, we are working with some piloting districts on the new portfolio. Users will have the ability to upload artifacts, add in text, and identify credentials from the site they want to display, and connect each to an Iowa Teaching Standard. This portfolio is only visible to the individual user and those with administrative privileges. We will be adding more in later newsletters. And finally, we will be launching our help-ticket system. This will allow users to ask for assistance by submitting a ticket, thus allowing multiple support people (including the district support personnel) the opportunity to assist. We will showcase this in the next update. With the password encryption, it is more important than ever that your district is allowing email from our system through. There are still a handful of districts blocking email from our server.